I've been pondering whether people with anti-social personality disorder can go to heaven. And I've been thinking that they probably can't. Which makes me sad because someone I love has it. But then I had a revelation that, it seems to me, that Samson had anti-social personality disorder. And he is esteemed in Christianity, as one of our heroes. He is, surely, going to heaven. So that gives me a lot more peace and hope that no mental illness is so bad that it can separate us from God. Far more men than women are affected. The condition is common in prison populations.Fire-setting and cruelty to animals during childhood are linked to the development of antisocial personality. 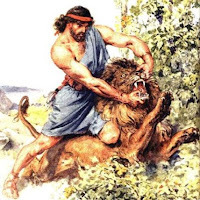 What I see in Samson: He was a Nazirite, whose life was supposed to be completely dedicated to the Lord, yet he seemed not to care about obeying the Jewish law, demonstrated by his choice in women (Philistines and prostitutes) and his lack of concern about touching the body of the dead lion. He also seems to lie quite easily, even to those he loves- his parent about the origin of the honey. His lover about the origin of his strength. He kills without a second thought. First, thirty men at his wedding. Then, later, a thousand men. He demonstrates cruelty to animals and pyromania when he started a fire by tying 300 foxes together in pairs and to lit torches. So in your opinion.. are you saying you think someone with aspd will go to heaven or not? I do think someone with anti-social personality disorder can go to heaven. Lets get straight to the point here Deena, TIMMY will go to heaven. Just know one thing though...even heaven, as bright and beautiful as most thinks, has a dark place hidden somewhere and that place is reserved for the one and only, Timmy. Ha Ha Ha Ha Ha! Great Day By The Fresh Beat Band!